Heritage conservation is founded on a modernist view of the supremacy of reason and science over faith, religion and belief. 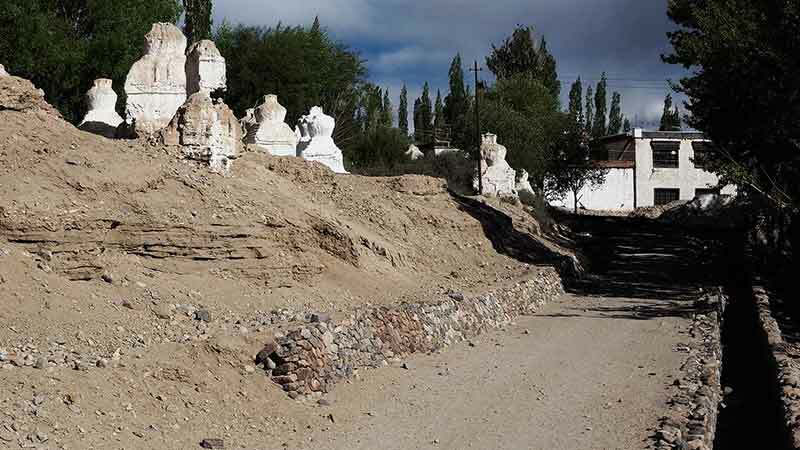 The foundations of these stupas were probably damaged by flood water before the roadway was built. Should conservation work be undertaken? This leads to the conservation policy of detaching objects from their cultural contexts and freezing them in time. If the culture that produced the object has died, this may be justifiable. 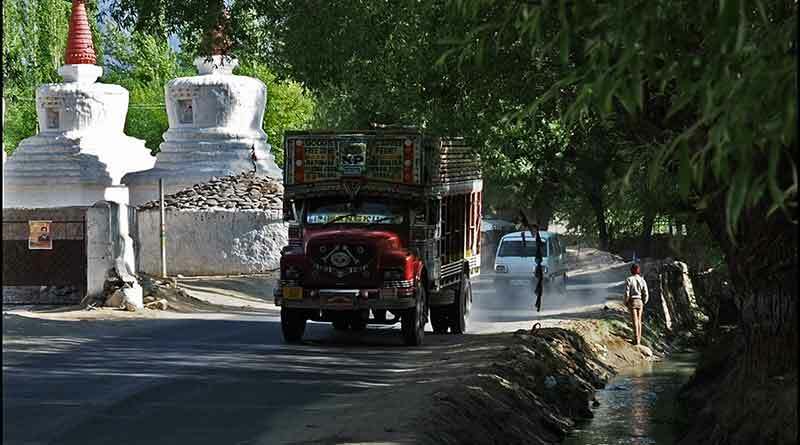 But a different policy is surely necessary when, as with Buddhism in Ladakh, the culture is alive. Stupas are a case in point. They were made for religious reasons, to symbolise man’s place in space-time and the universe. Building a stupa yields merit. Maintaining a stupa yields merit. Going clockwise around a stupa yields merit. Yet seeing a stupa decay is also instructive, as an illustration of impermanence, of anicca. With his last words, the Buddha reminded his followers that ‘All created things are impermanent’. So good actions are more important than any material or worldly goods. Similar considerations apply to the conservation of historic gardens, and much else. Denis Byrne writes that ‘the life of a stupa is one of disintegration and accumulation’. I agree, and I also believe ‘that the life of a garden is one of disintegration and accumulation’. Only a few gardens and a few stupas should be managed like museum exhibits. Some stupas do memorialise the lives of holy men, but none were conceived as ‘sleeping places’ for the dead, which is the origin of the word ‘cemetery’. The Buddha was cremated and his ashes were scattered by dividing them among his followers. 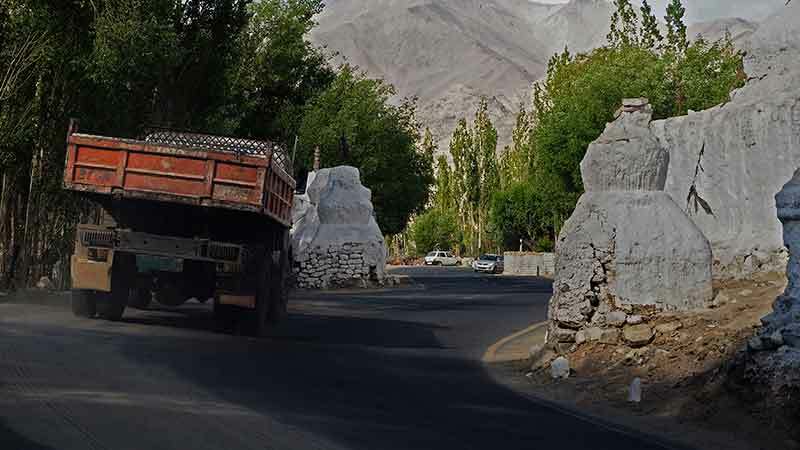 Roadside stupa in Ladakh: is it good that so many people see the stupa? Or is it bad that the trucks damage stupas? This entry was posted in Asian gardens and landscapes, Buddhist gardens and environmental ethics on 16th July 2018 by Tom Turner.